Socialite Hannah Latimer has left her glamorous lifestyle behind to become an aid worker. But when she's captured by an oppressive regime, her only means of escape is arrogant Prince Kamel of Surana. Just who is Lily Wrightington – cynical fashion photographer or studious art historian? Prince Marco di Lucchesi can't hide his disdain for this Englishwoman, or his strong attraction to her! Prince Demyan Zaretsky does whatever it takes to protect his country. So seducing Chanel Tanner, who holds the economic stability of Volyarus in her hands, will be easy. And marriage? An unfortunate side effect of duty. 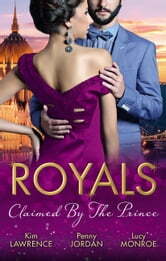 With his royal identity and intent disguised, Demyan sets about a ruthless seduction. But when he discovers Chanel is a virgin, he uncovers something in himself – a conscience. Now his plan takes a shocking turn – one this dark–hearted prince had never anticipated!